Renewal of lost / forgotten Honors - Bunyoro-Kitara Kingdom (Rep. Uganda) - The most powerful Kingdom in East Africa! 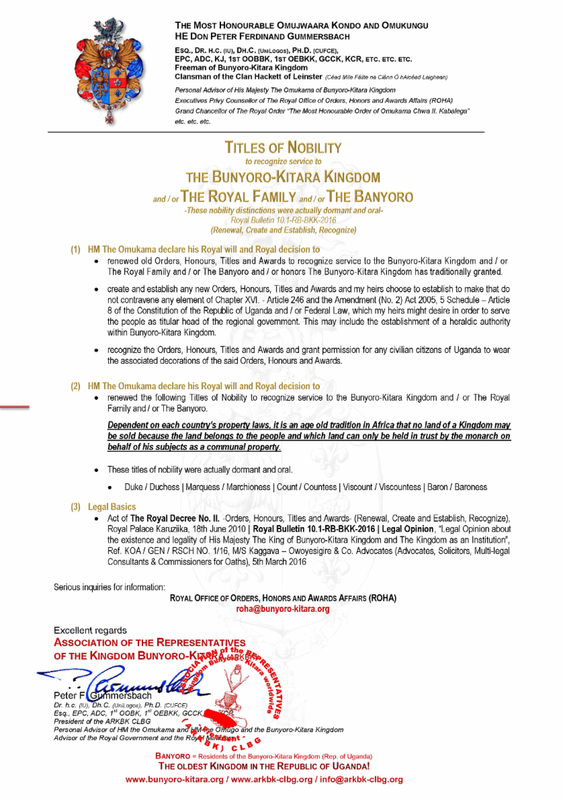 There is the option to renew former honors from the Bunyoro-Kitara Kingdom, if they are lost in the absence of documentations. By the partial oral tradition within the Bunyoro-Kitara Kingdom this is extremely difficult, of course. However, if someone can provide verifiable documentation (Certificate, Letter, Library-related certificate, Letters Patent, Brevet, etc.) which are required to withstand a control, can be applied for a renewal. "The renewal of the appointment / honor / etc. is made after careful study and control of the submitted documents and as direct successor and descendant of the great venerable and honourable Majesty Omukama Chwa II. Kabalega of Bunyoro-Kitara Kingdom; aware of the royal prerogatives and privileges, the Cultural History of the Bunyoro-Kitara Kingdom and the Royal Dynasty." The final, infallible, and inviolable decision is up to His Majesty The Omukama.